Tagged under Raita Honjou, Four Leaf Studios, Games. 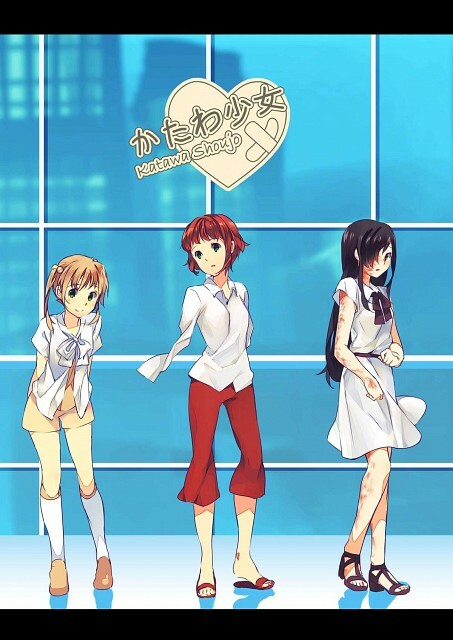 Katawa Shoujo is a romance-centered visual novel with a unique twist on the genre. The visual novel was developed by Four Leaf Studios, a collective comprised mainly of members of /b/, one of the most popular boards of the Internet forum 4chan. The source of inspiration was a bonus page included by Raita Honjou at the end of one of his doujinshi. The game can be downloaded for free from its official website. Overall, this game is a great choice for both beginners and experienced players. It's highly philosophical with a deep story line, is well written and as the not typical harem game, can enjoyable for many without converting them into a otaku. Also, it has a high replay ability and frankly said, I never played a game where the main characters got so attached to me as here they did. To recommend this game is like to strongly suggest a great book to someone. I personally adore it very dearly and can even say that it helped me to improve a tiny bit on my human side. Of course it has some flaws and despite being highly popular on the web, I cannot call it revolutionary in any aspect.